Whether at home, in the office, or traveling abroad, the DWM-152 provides reliable broadband connectivity for notebook users on the go. Maximum download speeds of up to 3.6Mbps allow you to do more with your mobile connection than ever before. For Mac OS X 10.4,10.5, 10.6, v1.05. 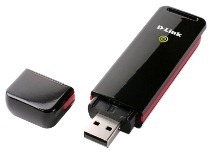 D-Link DWM-152 3.5G HSDPA USB Adapter Quick Installation Guide in 18 languages.